A new, below-the-hook, electric powered vacuum lifter for removing lead ingots from a kiln and handling other dense non-ferrous loads is being introduced by ANVER Corporation of Hudson, Massachusetts. 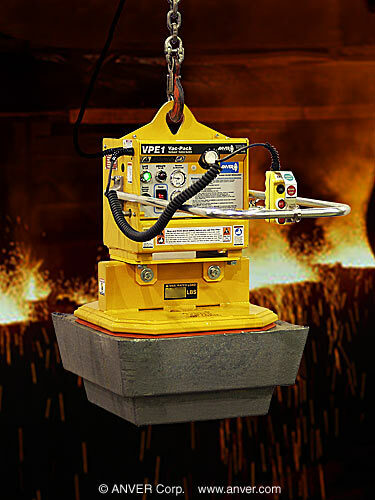 The ANVER VPE3 Ingot Lifter is an electric powered vacuum lifter that features a custom silicone vacuum suction pad designed for the momentary pick-and-place handling of loads up to 600°F. Ideally suited for removing lead, aluminum, bronze and other non-ferrous ingots from a kiln, this below-the-hook lifter is available in capacities up to 10,000 lbs. Built for safely handling heavy ingots from their top surface, the ANVER VP3 Ingot Lifter has an ergonomic handlebar and a detachable remote control. Featuring a VLS-8 Vacuum Loss Sensor, if a vacuum loss or leakage of 10% occurs, a loud horn will sound and a flashing bright LED warns the operator; while a check valve and reservoir help maintain vacuum.